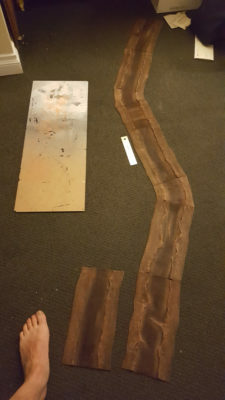 I’ve been calling my Infinity space station table project a space station since I started planning it, but really it’s been a collection of big walls and random bits until recently. What does a space station really need to make it feel like a space station? How about some actual space craft? 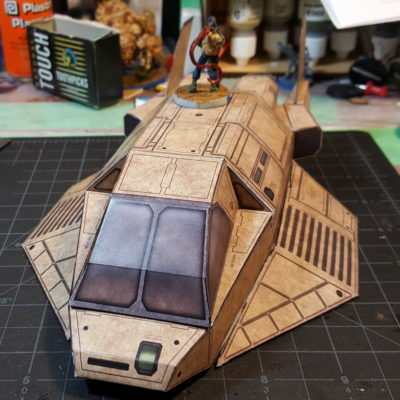 To that end I hit the excellent Genet Models site and grabbed a bunch of the free papercraft scenery PDFs there. 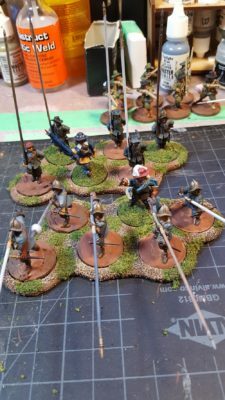 Genet is Christopher Roe’s site; he used to sell his PDFs under the Ebbles Miniatures and then Genet names but these days he gives them away for free! First I printed and built the basic Utility Shuttle in red. There’s a lot of grey and white on my space station table, I wanted something solidly colourful! The Utility Shuttle is only five parts – nose, body, tail, two wings – and quite straightforward to put together. The only issue I had with it was the central body piece was kind of loose and floppy to put together. 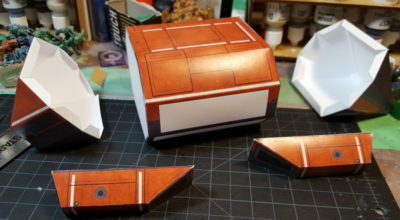 I’d printed everything on 65lbs light card; it might have been easier to put together with heavier 90 or 100lbs card. Once it’s assembled it’s all solid, though. 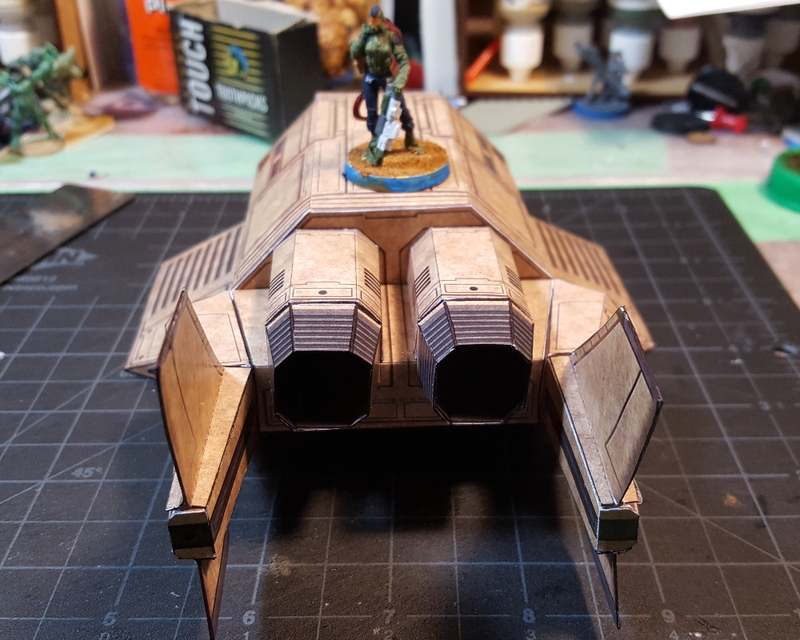 I left off the landing skids that are supposed to elevate the shuttle off the ground, to make it more obviously a Line of Sight blocker during Infinity games. All five subassemblies for the red Utility Shuttle. Click for larger. 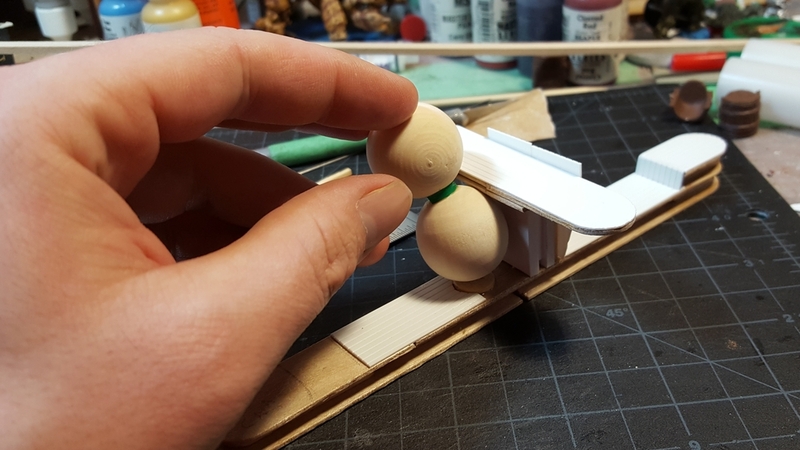 To cover the white strip that the landing skids are supposed to be glued to, I cut part of each landing skid up and glued it straight over the strip. 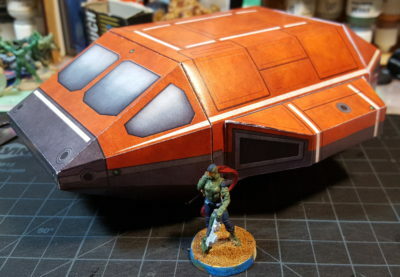 Completed red Utility Shuttle. Infinity Muyib infantry on 25mm base for scale. Click for larger. The second build is the VU-22 Percheron, a light shuttle/dropship. It’s only available in military colours, although there’s really nothing obviously military in it’s lines. 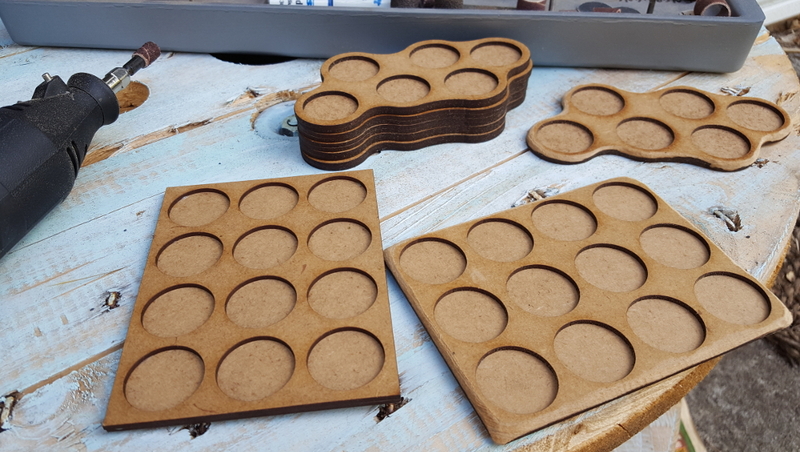 I might try re-colouring the white/black prototype version to get some civvie colours going, but for now I printed off the tan/sand coloured standard version. This is a more complex build with about 20 parts, some of them smaller and somewhat complex, but I actually found this an easier build overall than the Utility Shuttle. It’s a more recent design than the Utility and better engineered, with some internal bracing on potentially floppy and troublesome parts to assist with assembling. It’s about the same size, roughly, as the Utility Shuttle (I’ll post a group shot soon, don’t have one currently) but more complex, more interesting, and with better proportions than the chunky, simple Utility Shuttle design. I didn’t watch much of the new Battlestar Galactica TV show when it was on the air a few years ago, but a friend pointed out the Raptor inspiration for the Percheron. Percheron major subassemblies laid out. Click for larger. Percheron assembled, front view. Muyib for scale again. Click for larger. Most of the Percheron’s parts count is actually in the back end engine and tail assembly. The engine cones and tail pieces are a bit fiddly to assemble but look great when done. Percheron tail view. Muyib for scale again. Click for larger. 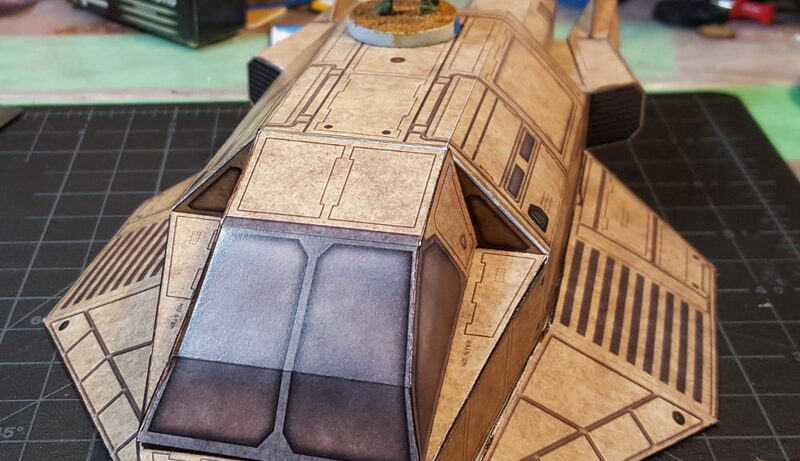 There don’t seem to be that many generic papercraft shuttles, dropships, or other wargaming-scaled spaceships available, so it’s awesome that Genet is making their PDFs available for free. There’s a bunch more spacecraft available there, including the massive VT-3 Pinzgauer cargo shuttle, that I might yet build up to decorate Infinity tables with, as well as some smaller details like cargo-handling exoskeletons and such that would make great looking “dockside” clutter around the docks and hangar bays of a space station. I’ll almost certainly be building up more Genet Models cardstock kits in the future! 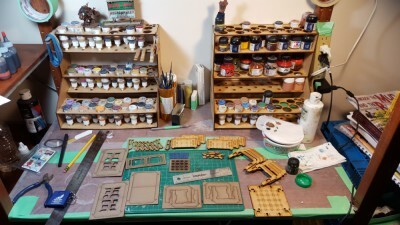 New paint rack in place, top right, and an Impudent Mortal elevator spread out across the bench. 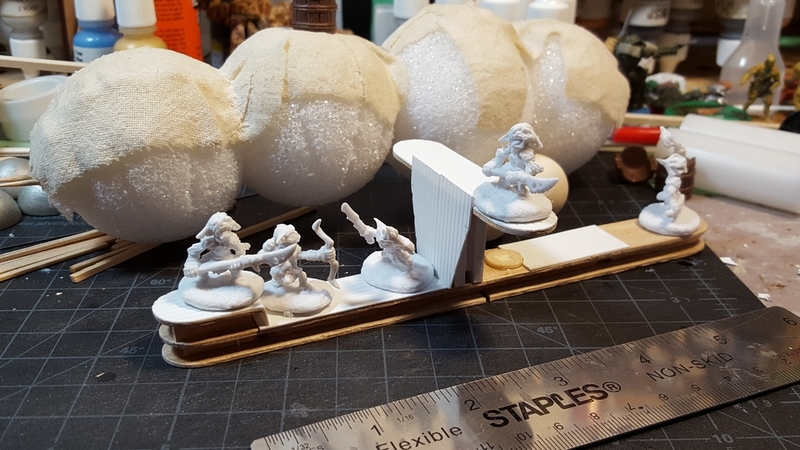 My Impudent Mortal order arrived last week, and I’ve assembled the new paint rack already. 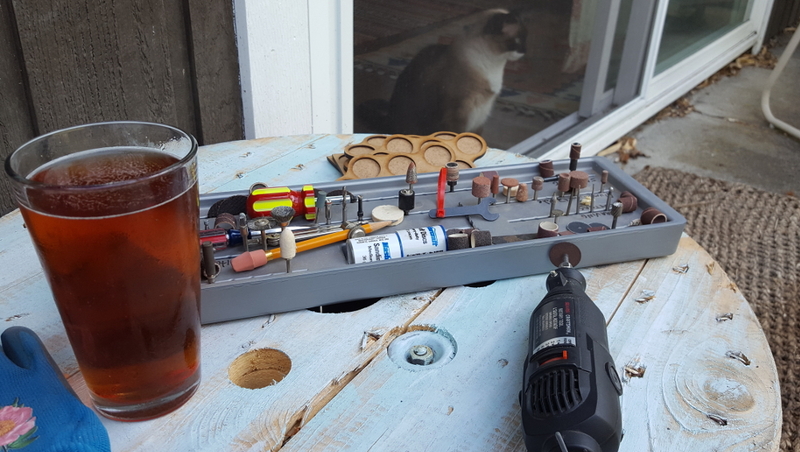 It’s an exact duplicate of the one I bought back in 2014 and should help keep the rest of my workbench relatively uncluttered, at least of paint, figures, and small projects that can go up onto the shelves of the rack somewhere! 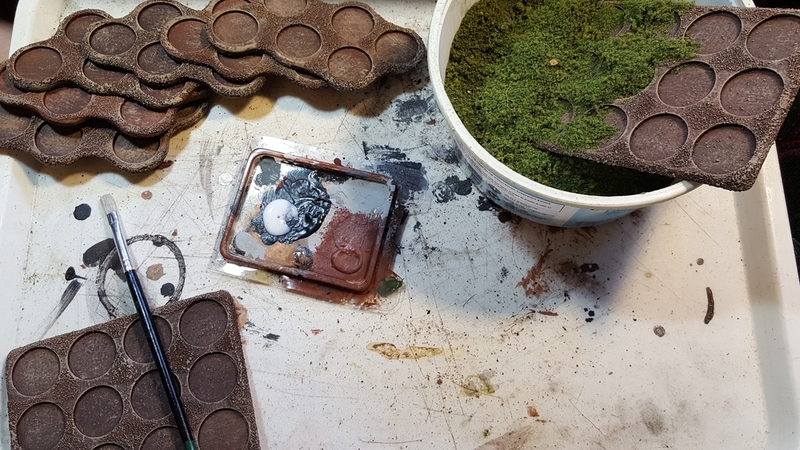 Spread out across the foreground is the components of Impudent Mortal’s Near Future Elevator Set, which should make for good looking scatter terrain on our Infinity tables soon! More about those in a future post as I actually start assembly of the first one. 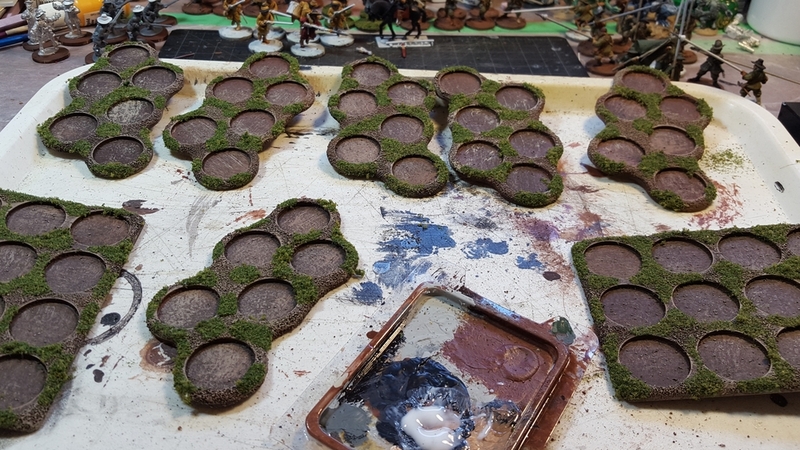 Also in progress and needing a post soon is new dugouts for Blood Bowl, to go along with the scoreboard I made in November. This is a wargaming website run by a pair of Canadians. It’s hosted on a Canadian server (a very deliberate decision, I should point out). So why is this post about American politics? Because SOPA (the Stop Online Piracy Act) and it’s evil twin PIPA (the Protect IP Act) currently being debated by American legislators are so mind-bogglingly stupid, badly thought out and vile, frankly. And because, especially under our current Conservative government up here, Canada has a bad habit of following our giant southern neighbour happily over whatever stupid policy cliff it’s just launched itself. SOPA/PIPA is a really, really big cliff. One that could wind up with the wreckage of much of the Internet as we know it splattered at the base of it. Michael Giest has a great article on Why Canadians Should Participate in the SOPA/PIPA Protest. Read it before he blacks out his site. I also know from the site stats we keep here that significant number of our visitors are American. Unlike those of us from overseas, who just have to watch in horrified astonishment and make what protests we can, our American visitors have Senate and Congressional Representatives they can, and should, be contacting to hammer home just what bad laws SOPA/PIPA are. Wikipedia is going black. So are WordPress.org, BoingBoing, Reddit and a host of tech and geeky sites. Closer to wargaming, TGN and parent site CMON are going black. We”ll be blacking out Warbard in solidarity from 0800-2000 PST Wednesday the 18th. We’ll be back that evening, and so will all those much, much larger sites I mentioned above. But if SOPA/PIPA are rammed through, huge swathes of the Internet as we presently know it could wind up black for good, wrecked by bad laws passed by idiots.